1. Das S. Urologic laparoscopy: the future is now. Urol Clin NA2001; 28:1-3. 2. Carroll PR. Editorial: Laparoscopic urologic surgery: differentiating what should be done from what can be done. J Urol 1994; 151:1603-1604. 3. Moran ME, Kim Dh, Abrahams HM. Ideal suture characteristics. Reconstructive laparoscopic surgery. J Endourol 2001; 15:68. 4. Clarke HC. Laparoscopy-new instruments for suturing and ligation. Fertil Steril 1972; 23:274-277. 5. Ko S-T, Airan MC. Therapeutic laparoscopic suturing techniques. Surg Endosc 1992; 6:41-46. 6. Semm K. Pelvioscopic uterine surgery. Surg Endosc 1992; 6:23-31. 7. Marrero MA, Corfman RS. Laparoscopic use of sutures. Clin Obstet Gynecol 1991; 34:387-394. 8. Moran ME, Bowyer DW, Szabo Z. Laparoscopic suturing in urology: a model for vesicourethral anastomosis. Minim Invasive Ther 1993; 2:165-170. 9. Frede T, Stock C, Rassweiler JJ, Alken P. Retroperitoneoscopic and laparoscopic suturing: tips and strategies to improve efficiency. J Endourol 2000; 14:905-913. 10. Matern U, Waller P. Instruments for minimally invasive surgery. Surg Endosc 1999; 13:174-182. 11. den Boer KT, Herder JL, Sjoerdsma W, Meijer DW, Gouma DJ, Stassen HG. Sensitivity of laparoscopic dissectors. What can you feel? Surg Endosc 1999; 13:869-873. 12. Breedveld P, StassenHG, Meijer DW, Jakimowicz JJ. Manipulation in laparoscopic surgery: overview of impeding effects and supporting aids. J Laparoendosc Advanc Surg Techniq 1999; 9:469-480. 13. Emam TA, Frank TG, Hanna GB, Cuschieri A. Influence of handle design on the surgeon's upper limb movements, muscle recruitment, and fatigue during endoscopic suturing. Surg Endosc 2001; 15:667-672. 14. Mukherjee R, Minor M, Song G, Satava R. Optimisation of an articulated instrument for enhanced dexterity in minimally invasive therapy. Minim Invasive Ther Allied Technol 1998; 7:335-342. 15. Matern U, Waller P, Giebmeyer ME, Ruckauer KD, Farthmann EH. Ergonomics: requirements for adjusting the height of laparoscopic operating room tables. JSLS 2001; 5:7-12. 16. Moran ME. Laparoscopic suturing and skills acquisition: methods to improve efficiency. J Endourol 2000; 14:913-914. 17. Gomella LG. Editorial: Laparoscopy and urologic oncology—I now pronounce you man and wife. J Urol 2003; 169:2057-2058. 18. Moran ME. Robotic surgery: urologic implications. J Endourol 2003; 17:695-708. 19. Costi R, Denet C, Sarli L, Pernicen T, Roncoroni L, Gayer B. Laparoscopy in the last decade of the millennium. Have we really improved? Surg Endosc 2003; 17:791-797. 20. Meilahn JE. The need for improving laparoscopic suturing and knot tying. J Laparoendosc Surg 1992; 2:267. 21. Bisson J, Vinson RK, Leadbetter GW. Urolithiasis from stapler anastomosis. Am J Surg 1989; 137:280. 22. Ravo B, Rosales C, Serino F, Castagneto M. The use of absorbable staples for construction of a bladder tube. Surgery 1991; 173:29. 23. Low RK, Moran ME. Argon beam coagulation: implications for reconstructive urology. Minim Invasive Ther 1993; 2:75-78. 24. Kirker-Head CA, Steckel RR, Schwartz A, Williams R. Evaluation of surgical staples for ligation of the renal pedicle during nephrectomy. Urol Res 1988; 16:63. 25. Sugarbaker DJ, Mentzer SJ. Improved technique for hilar vascular stapling. Ann Thorac Surg 1992; 53:165. 26. Kerbl K, Chandhoke PS, McDougall E, Clayman R, Marika Stone A, Hicks M.Laparoscopic clips and staples: vascular application. J Endourol 1992; 6:S142. 27. Moran ME. Theory of vascular pedicle hemostasis during laparoscopic nephrectomy. Minim Invasive Ther 1991; 1:A69. 28. Nathanson LK, Easter DW, Cuschieri A. Ligation of the structures of the cystic pedicle during laparoscopic cholecystectomy. Am J Surg 1991; 161:350. 29. Nathanson LK, Nathanson PDK, Cuschieri A. Safety of vessel ligation in laparoscopic surgery. Endoscopy 1991; 23:206. 30. Nelson MT, Nakashima M, Mulvihill SJ. How safe are laparoscopically placed clips? An in vitro and in vivo study. Arch Surg 1992; 127:718. 31. Beltran KA, Foresman PA, Rodeheaver GT. Quantitation of force to dislodge endoscopic ligation clips: EndoClip II vs. LigaClip ERCA. J Laparoendosc Surg 1994; 4:253-256. 32. Feldman SL, Presman D, Kandel GL. Renal arteriovenous fistula following nephrectomy. Br J Urol 1985; 57:592. 33. Goldstein AG, Delaurentis DA, Schwarz AJ. Post-nephrectomy arteriovenous fistula. Br J Urol 1967; 98:44. 34. Lacombe M. Renal arteriovenous fistula following nephrectomy. Urology 1985; 25:13. 35. Baniel J, Schein M. Partial nephrectomy using a linear stapling device. Br J Urol 1992; 69:218. 36. Avant LO, Starr GA. Vesicourethral reanastomosis by mechanical stapling and transurethral deep dorsal venous ligation: a new technique for radical retropubic prostatectomy. J Endourol (submitted). 37. Dziki AJ, Duncan MD, Harmon JW, et al. Advantages of handsewn over stapled bowel anastomosis. Dis Col Rect 1991; 34:442. 38. Jansson OK, Zilling TL, Walther BS. Healing of colonic anastomoses: comparative experimental study of glued, manually sutured, and stapled anastomoses. Dis Col Rect 1991; 34:557. 39. Moritz E, Achleitner D, Holbling N, Miller K, Speil T, Weber F. Single vs. double stapling technique in colorectal surgery. A prospective randomized trial. Dis Col Rect 1991; 34:495. 40. West of Scotland and Highland Anastomosis Study Group. Suturing or stapling in gastrointestinal surgery: a prospective randomized study. Br J Surg 1991; 78:337; Griffith DP, Gleeson MJ. The prosthetic bladder-perhaps the technology has arrived. Scand J Urol Nephrol 1992; 142:109. 41. Clayman RC, McDougall E, Chandhoke PS, Kerbl K, Marika Stone A. Laparoscopic ureteral reimplantation: laboratory studies. J Endourol 1992; 6:S144. 42. Chiu AW, Chen MT, Huang WJS, Juang GD, Lu SH, Chang LS. Case report: laparoscopic nephroureterectomy and endoscopic excision of bladder cuff. Minim Invasive Ther 1992; 1:299. 43. Das S. Laparoscopic removal of bladder diverticulum. J Urol 1992; 148:1837-1839. 44. Parra RO, Jones JP, Andrus CH, Hagood PG. Laparoscopic diverticulectomy: preliminary report of a new approach for the treatment of bladder diverticulum. J Urol 1992; 148:869. 45. Parra RO, Andrus CH, Jones JP, Boullier JA. Laparoscopic cystectomy: initial case report on a new treatment for the retained bladder. J Urol 1992; 148:1140. 46. Clayman RV, Kavoussi LR, Gigenshau RS, Chandhoke PS, Albala DM. Laparoscopic nephroureterectomy: initial case report. J Laparoendosc Surg 1991; 1:343. 47. Grainger DA, Meyer WR, DeCherney AH, Diamond MP. Laparoscopic clips: evaluation of absorbable and titanium with regard to hemostasis and tissue reactivity. J Reprod Med 1991; 36:493. 48. Schuessler WW, Vancaillie TG, Preminger GM. Laparoscopic dismembered pyeloplasty. Minim Invasive Ther 1992; 1(suppl):A68 (abstract B-30). 49. Kerbl K, Chandhoke PS, McDougall E, Figenshau RS, Stone AM, Clayman RV. Laparoscopic stapled bladder closure: laboratory and clinical experience. J Urol 1993; 149:1437. 50. Gluckman OR, Stoller M, Irby P. Laparoscopic pyelocaliceal diverticula ablation. J Endourol 1993; 7:315-317. 51. Levinson AK, Greskovich FJ, Swanson DA, Stephenson RA, Johnson DE, Lichtiger B. Fibrin glue for partial nephrectomy. Urology 1991; 38:314. 52. Winfield HN, Donovan JF, Godet AS, Clayman RV. Human laparoscopic partial nephrectomy: initial case report for benign disease. J Endourol 1993; 7:521-526. 53. Satava RM. Surgery 2001: a technologic framework for the future. Surg Endosc 1993; 7:111-113. 54. Halsted W. The training of the surgeon. Bull Johns Hop Hosp 1904; 15:267-276. 55. Rothschild JG. What alternatives has minimally invasive surgery provided the surgeon? Arch Surg 1998; 133:1156-1159. 56. Derossis AM, Fried GM, Abrahamowicz M, Sigman HH, Barkun JS, Meakins JL. Development of a model for training and evaluation of laparoscopic skills. Am J Surg 1998; 175:482-487. 57. Hanna GB, Drew T, Clinch P, et al. Psychomotor skills for endoscopic manipulations: differing abilities between right and left-handed individuals. Ann Surg 1997; 225:333-338. 58. Hanna GB, Cuschieri A. Influence of the optical axis-to-target angle on endoscopic task performance. Surg Endosc 1999; 13:371-375. 59. Holden JG, Flach JM, Donchin Y. Perceptual-motor coordination in an endoscopic surgery simulation. Surg Endosc 1999; 13:127-132. 60. Hanna GB, Shimi S, Cuschieri A. Influence of direction of view, target-to-endoscope distance and manipulation angle on endoscopic knot tying. Br J Surg 1997; 84:1460-1464. 61. Breedveld P, Stassen HG, Meijer DW, Stassen LPS. Theoretical background and conceptual solution for depth perception and eye-hand coordination problems in laparoscopic surgery. Minim Invasive Ther Allied Technol 1999; 8:227-234. 62. Kum CK, Goh P, Alexander DJ, Moochala S. Three-dimensional versus two-dimensional imaging for laparoscopic suturing. Br J Surg 1997; 84:35. 63. Barnes RW. Surgical handicraft: teaching and learning surgical skills. Am J Surg 1987; 153:422-427. 64. Reznick RK. Teaching and testing technical skills. Am J Surg 1993; 165:358-361. 65. Dent TL. Training and privileging for new procedures. Surg Clin NA1996; 76:615-621. 66. Macmillan AIM, Cuschieri A. Assessment of innate ability and skills for endoscopic manipulations by the advanced Dundee endoscopic psychomotor tester: predictive and concurrent validity. Am J Surg 1999; 177:274-277. 67. Lang NP, Rowland-Morin PA, Coe NP. Identification of communication apprehension in medical students starting surgery rotation. Am J Surg 1998; 176:41-45. 68. Smith DM, Kolb DA. User's Guide for the Learning-Style Inventory. A Manual for Teachers and Trainers. Boston: McBer and Co., 1986. 69. Lynch TG, Woelfl NN, Steele DJ, Hanssen CS. Learning style influences student examination performance. Am J Surg 1998; 176:62-66. 70. Kaufman HH, Wiegand RL, Tunick RH. Teaching surgeons to operate-principles of psychomotor skills training. Acta Neurochir 1987; 87:1-7. 71. Jones MB, Kennedy RS. Isoperformance curves in applied psychology. Human Factors 1996; 38:167-182. 72. Melvin WS, Johnson JA, Ellison EC. Laparoscopic skills enhancement. Am J Surg 1996; 172:377-379. 73. Sammarco MJ, Youngblood JP. A resident teaching program in operative endoscopy. Obstet Gynecol 1993; 81:463-466. 74. Schirmer BD, Edge SB, Dix J, Miller AD. Incorporation of laparoscopy into a surgical endoscopy training program. Am J Surg 1992; 163:46-52. 75. Wolfe BM, Szabo Z, Moran ME, Chan P, Hunter JG. Training for minimally invasive surgery: need for surgical skills. Surg Endosc 1993; 7:112-114. 76. Heniford BT, Backus CL, Matthews BD, Greene FL, Teel WB, Sing RF. Optimal teaching environment for laparoscopic splenectomy. Am J Surg 2001; 181:226-230. 77. Anastakis DJ, Regehr G, Reznick RK, et al. Assessment of technical skills transfer from the bench training model to the human model. Am J Surg 1999; 177:167-170. 78. Ko CY, Whang EE, Karamanoukian R, Longmire WP, McFadden DW. What is the best method of surgical training? Areport of America's leading senior surgeons. Arch Surg 1998; 133:900-905. 79. Martin JA, Regehr G, Reznick R, et al. Objective structured assessment of technical skill (OSATS) for surgical residents. Br J Surg 1997; 84:273-278. 80. Rosser JC, Rosser LE, Savalgi RS. Skill acquisition and assessment for laparoscopic surgery. Arch Surg 1997; 132:200-204. 81. Steele RJC, Walder C, Herbert M. Psychomotor testing and the ability to perform an anastomosis in junior surgical trainees. Br J Surg 1992; 79:1065-1067. 82. Medina M. Formidable challenges to teaching advanced laparoscopic skills. JSLS 2001; 5:153-158. 83. Macmillan AIM, Cuschieri A. Assessment of innate ability and skills for endoscopic manipulations by the advanced Dundee endoscopic psychomotor tester: predictive and concurrent validity. Am J Surg 1999; 177:274-277. 84. Francis NK, Hanna GB, Cuschieri A. Reliability of the Dundee endoscopic psychomotor tester (DEPT) for dominant hand performance. Surg Endosc 2001; 15:673-676. 85. Fried GM, Derossis AM, Bothwell J, Sigmann HH. Comparison of laparoscopic performance in vivo with performance measured in a laparoscopic simulator. Surg Endosc 1999; 13:1077-1081. 86. Rosser JC, Rosser LE, Savalgi RS. Objective evaluation of a laparoscopic surgical skill program for residents and senior surgeons. Arch Surg 1998; 133:657-661. 87. Derossis AM, Antoniuk M, Fried GM. Evaluation of laparoscopic skills: a 2-year follow-up during residency training. Can J Surg 1999; 42:293-296. 88. Olinger A, Pistorius G, Lindemann W, Vollmar B, Hildebrandt U, Menger MD. Effectiveness of a hands-on training course for laparoscopic spine surgery in a porcine model. Surg Endosc 1999; 13:118-122. 89. Meier AH, Rawn CL, Krummel TM. Virtual reality: surgical application — challenge for the new millennium. J Am Coll Surg 2001; 192:372-384. 90. Ramshaw BJ, Young D, Garcha I, et al. The role of multimedia interactive programs in training for laparoscopic procedures. Surg Endosc 2001; 15:21-27. 91. Rosser JC, Herman B, Risucci DA, Murayama M, Rosser LE, Merrell RC. Effectiveness of a CD-ROM multimedia tutorial in transferring cognitive knowledge essential for laparoscopic skill training. Am J Surg 2000; 179:320-324. 92. Rogers DA, Regehr G, Howdieshell TR, Yeh KA, Palm E. The impact of external feedback on computer-assisted learning for surgical technical skill training. Am J Surg 2000; 179:341-343. 93. Mann CC. The end of Moore's Law? Technol Rev 2000:42-48. 94. Haluck RS, Krummel TM. Computers and virtual reality for surgical education in the 21st century. Arch Surg 2000; 135:787-792. 95. Krummel TM. Surgical simulation and virtual reality: the coming revolution. Ann Surg 1998; 228:635-637. 96. Marescaux J, Clement J-M, Tassetti V, et al. Virtual reality applied to hepatic surgery simulation: the next revolution. Ann Surg 1998; 228:627-634. 97. Trunkey DD, Botney R. Assessing competency: a tale of two professions. J Am Coll Surg 2001; 192:385-395. 98. Rosser JC, Murayama M, Gabriel NH. Minimally invasive surgical training solutions for the twenty-first century. Surg Clin NA 2000; 80:1607-1624. 99. Satava RM, Jones SB. Preparing surgeons for the 21st century. Surg Clin NA 2000; 80:1353-1365. 100. Moore RG, Adams JB, Partin AW, Docimo SG, Kavoussi LR. Telementoring of laparoscopic procedures: initial clinical experience. Surg Endosc 1996; 10:107-110. 101. Lee BR, Bishoff JT, Janetschek G, et al. A novel method of surgical instruction: international tele-mentoring. World J Urol 1998; 16:367-370. 102. Cubano M, Poulose BK, Talamini MA, et al. Long distance telementoring. A novel tool for laparoscopy aboard the USS Abraham Lincoln. Surg Endosc 1999; 13:673-678. 103. Broderick TJ, Harnett BM, Merriam NR, Kapoor V, Doarn CR, Merrel RC. Impact of varying transmission bandwidth on image quality. Telemed J E Health 2001; 7:47-53. 104. Gandsas A, Draper K, Chekan E, et al. Laparoscopy and the internet. Surg Endosc 2001. 105. Durst L. The center for minimal access surgery—teaching for tomorrow. J Telemed Telecare 2000; 6:S14-S15. 106. Green LS, Loughlin KR, Kavoussi LR. Management of epigastric vessel injury during laparoscopy. J Endourol 1992; 6:99. 107. Nathanson LK, Cuschieri A. The falciform lift: a simple method for retraction of falciform ligament during laparoscopic cholecystectomy. Surg Endosc 1986; 4:1787. 108. Mettler L, Semm K. Pelviscopic uterine surgery. Surg Endosc 1992; 6:23. 109. 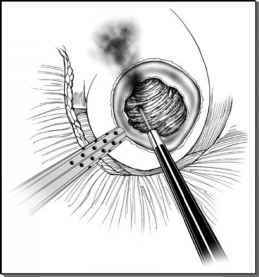 Reich H, Clarke C, Sekel L. A simple method for ligating with straight and curved needles in operative laparoscopy. Obstet Gynecol 1992; 79:143. 110. Nathanson LK, Nathanson PDK, Cuschieri A. Safety of vessel ligation in laparoscopic surgery. Endoscopy 1991; 23:206. 111. Cuschieri A, Shimi S, Nathanson LK. Laparoscopic reduction, crural repair, and fundoplication of large hiatal hernia. Am J Surg 1992; 163:425. 112. McComb PF. A new suturing instrument that allows the use of microsuture at laparoscopy. Fertil Steril 1992; 57:936. 113. Oko M, Rosin RD. Extracorporeal knotting with a new instrument. Minim Invasive Ther 1993; 2:1-3. 114. Puttick MI, Nduka BA, Darzi A. Extracorporeal knot tying using an atraumatic Babcock clamp. J Laparoendosc Surg 1994; 4:339-341. 115. Kennedy JS. A technique for extracorporeal suturing. J Laparoendosc Surg 1992; 2:269-262. 116. Andrews S, Lewis JL. Minimal access suturing: an assessment of knot substitutes. Minim Invasive Ther 1992; 1:309. 117. Moran ME. Stationary and automated laparoscopically assisted technologies. J Laparoendosc Surg 1993; 3:221-227. 118. Tonietto G, Pintaldi S. Finger-assisted laparoscopic surgery. J Laparoendosc Surg 1994; 4:205-207. 119. Tan HL, Hutson JM. Case report: laparoscopically-assisted cysto-prostatectomy. Minim Invasive Ther 1994; 3:207-210. 120. Daum IW. 'EndoHand,' an manipulator for M.I.S. Minim Invasive Ther 1994; 3(suppl 1):7 (abstract O-86). 121. Schurr T, Melzer A, Dautzenberg P, Neisius B, Trapp R, Buess G. Development of steerable instruments for minimal invasive surgery in modular conception. Acta Chir Belg 1993; 63:73-77. 122. Durrani AF, Preminger GM. Advanced endoscopic imaging: 3-D laparoscopic endoscopy. In: Szabo Z, Kerstein MD, Lewis JE, eds. Surgical Technology International II. San Francisco, CA: Universal Medical Press Inc., 1994:141-147. 123. Calvano CJ, Moran ME, Tackett LD, Reddy PP, Boyle KE, Pankratov MM. New visualization techniques for in utero surgery: amnioscopy with a three dimensional head mounted display and a computer controlled endoscope. J Endourol 1998; 12:407-410. 124. Wolf JS Jr., Carrier S, Stoller ML. Gas embolism: helium is more lethal than carbon dioxide. J Laparoendosc Surg 1994; 4:173-177. 125. Henderson MR, Link WJ, Glover JL, Incropera FP. Gas transport resulting from plasma-scalpel surgery. Med Biol Eng 1974; 12:208-213. 126. Kozlowski PM, Winfield HN. Laparoscopic partial nephrectomy and wedge resection. J Endourol 2000; 14:865-870. 127. Jackman SV, Bishoff JT. Laparoscopic retroperitoneal renal biopsy. J Endourol 2000; 14:833-838. 128. Crabtree JH, Fishman A. Videoscopic argon beam coagulator treatment of large persistent lympho-cele. J Laparoendosc Surg Tech 2000; 10:63-65. 129. Stifelman MD, Sosa RE, Nakada SY, Schichman SJ. Hand-assisted laparoscopic partial nephrectomy. J Endourol 2001; 15:161-164. 130. Hernandez AD, Smith JA Jr., Jeppson KG, Terreros DA. A controlled study of the argon beam coagulator for partial nephrectomy. J Urol 1990; 143:1062-1065. 131. Chan DY, Marshall FF. Partial nephrectomy for centrally located tumors. Urology 1999; 54:1088-1091. 132. Shapiro MJ, Minor CB Jr., Brems J, Hayek M. Argon beam coagulator hepatorrhaphy in potential donors. Am Surg 1992; 58:353-354. 133. Majeski J. Advances in general and vascular care of Jehovah's Witnesses. Int Surg 2000; 85:257-265. 134. Dunham CM. The role of the argon beam coagulator in splenic salvage. Surg Gyn Obstet 1991; 173:179-182. 135. Go PM, Goodman GR, Bruhn EW, Hunter JG. The argon beam coagulator provides rapid hemosta-sis of experimental hepatic and splenic hemorrhage in anticoagulated dogs. J Trauma 1991; 31:1294-1300. 136. Dowling RD, Ochoa J, Yousem SA, Peitzman A, Udekwu AO. Argon beam coagulation is superior to conventional techniques in repair of experimental splenic injury. J Trauma 1991; 31:717-720. 137. Stylianos S, Hoffman MA, Jacir NN, Harris BH. Sutureless hemisplenectomy. J Ped Surg 1991; 26:87-89. 138. Go PM, Bruhn EW, Garry SL, Hunter JG. Patterns of small intestinal injury with the argon beam coagulator. Surg Gyn Obstet 1990; 171:341-342. 139. Rusch VW, Schmidt R, Shoji Y, Fujimura Y. Use of the argon beam coagulator for performing pulmonary wedge resection. Ann Thorac Surg 1990; 49:287-291. 140. Stojeba N, Mahoudeau G, Segura P, Meyer C, Steib A. Possible venous argon gas embolism complicating argon gas enhanced coagulation during liver surgery. Acta Anaesth Scand 1999; 43:866-867. 141. Anonymous. Fatal gas embolism caused by over pressurization during laparoscopic use of argon enhanced coagulation. Health Devices 1994; 23:257-259. 142. Cartmill J, Patkin M, Graber JG, Schultz LS, Hickok DF, Isabel L. Ergonomics and needle holding ability of laparoscopic needle holders. Surg Endosc 1993; 128 (abstract 132). 143. Agarwal DK, Gaur DD, Agarwal M. A new concept of laparoscopic suturing. Minim Invasive Ther 1994; 227-29. 144. Moran ME, Calvano CJ, Reddy PP, Rahman SB, Melhaff BA. Laparoscopic needle passage: a chart for intracorporeal suturing. J Endourol 1996; 10:S189. 145. Cuschieri A, Szabo Z. Tissue Approximation in Endoscopic Surgery. Oxford: Isis Medical Media, 1995:90-94. 146. Waninger J, Kauffmann GW, Shah IA, Farthmann EH. Influence of the distance between interrupted sutures and the tension of sutures on healing of experimental colonic anastomoses. Am J Surg 1992; 163:319. 147. Abrahams HM, Kim DH, Moran ME. Intracorporeal interrupted suturing: the ideal length of suture material. JSLS 2001; 5:383-384. 148. Desai PJ, Moran ME, Calvano CJ. Running suturing: the ideal suture length facilitates this task. J Endourol 1999; 13:A1. 149. Moran ME. Laparoscopic suturing skills acquisition: methods to improve efficiency. J Endourol 2001; 14:913-914. 150. Szabo Z, Rose EH, Ellis MS, Burch BH. Slip-knot suspension technique: a fail-safe microanastomosis for small-caliber vessels. Microsurgery 1992; 13:100-102. 151. Bowyer DW, Moran ME, Szabo Z. Laparoscopic suturing in urology: a model for the lower urinary tract. J Endourol 1992; 6:S142. 152. Szabo Z, Bowyer DW. Laparoscopic suturing: principles and techniques. In: Das S, Crawford ED, eds. Urologic Laparoscopy. Philadelphia PA: W.B. Saunders, 1994:225-244. 153. Pietrafitta JJ. A technique of laparoscopic knot tying. J Laparoendosc Surg 1992; 2:273-275. 154. Kozminski M, Richards WH III. Fly-fishing method of intracorporeal knot tying. Urology 1994; 44:577-578. 155. Cuschieri A. Tissue approximation. Probl Gen Surg 1991; 8:366-377. 156. Moran ME, Kim DH, Abrahams HM. Ideal suture characteristics. Reconstructive laparoscopic surgery. J Endourol 2001; 15:68. 157. Soper NJ, Hunter JG. Suturing and knot tying in laparoscopy. Surg Clin NA1992; 72:1139-1152. 158. Bowyer DW, Moran ME, Szabo Z. Laparoscopic suture materials. Western Section AUA, 1st Prize Round Table, Kuaui HI, October 1992. 159. Abrahams HM, Kim DH, Moran ME. Intracorporeal interrupted suturing: the ideal length of suture material. JSLS 2001; 5:383-384. 160. Moran ME, Abrahams HM, Kim DH. Suture length is a key variable in suturing efficiency. J Endourol 2001; 15:A22, A1-P5. 161. Meizer A, Lirici MM, Reuthebuch O, Trapp R, Beuss G. New knotting, ligature, and purse string techniques. Minim Invasive Ther 1992; 1:74. 162. Gomes da Silva E. Suturescope: a new device that allows endoscopic sutures to be performed with traditional threads. Surg Endosc 1990; 4:220. 163. Saclarides TJ, Smith L, Ko S-T, Orkin B, Buess G. Transanal endoscopic microsurgery. Dis Colon Rect 1992; 35:1183-1191. 164. Szabo Z, Avery GJ II, Sandor A, Litwin DEM. Suturing and knotting techniques for thoracoscopic cardiac surgery. Surg Clin NA2000; 80:1555-1574. 165. Hoznek A, Solomon L, Rabi R, et al. Vesicourethral anastomosis during laparoscopic radical prostatectomy: the running suture method. J Endourol 2000; 14:749-753. 166. Van Velthoven RF, Ahlering TE, Peltier A, Skarecky DW, Clayman RV. Technique for laparoscopic running urethrovesical anastomosis: the single knot method. Urology 2003; 61:699-702. 167. Menon M, Tewari A, Peabody JO. Vattikuti Institute prostatectomy: technique. J Urol 2003; 169:2289-2292. 168. Desai PJ, Moran ME, Parekh AR, Calvano CJ. Running suturing: the ideal suture length facilitates this task. J Endourol 2000; 14:191-194.